Fitbit. It's the name on everyone's lips. At least the name on the lips of anyone that has an interest in wearables. Particularly, it's continuing foray into the competitive world of smartwatches. The company had a lot to talk about its future this week, and we may have got a glimpse of that future with a little bit of an exclusive. Away from all things Fitbit, we were out in Barcelona for MWC to see some new wearables. We already have eyes on what's in store at the Baselworld watch fair at the end of the month. We think it's set to be a busy one. So what exactly has been going down this week? Here's our rundown of the big wearable tech stories, plus our pick of the best reads on the site to head to next. So according to Fitbit's latest earnings call, the Ionic, its debut smartwatch, hasn't been selling like hotcakes. In fact there has been higher demand for its Charge 2 and Blaze fitness trackers. 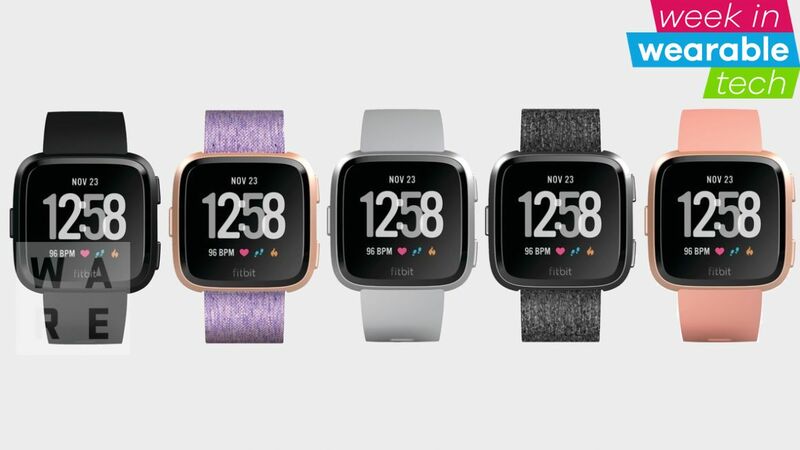 So it promised to deliver a 'mass appeal' smartwatch later in 2018 - and we didn't have wait too long to find out what this smartwatch looked like, as we exclusively got hold of pictures and details of the new Fitbit smartwatch. Along with a new look and a selection of colours, the watch will be swim-friendly and pack the same relative SpO2 sensor as found inside the Ionic (but no GPS). There were definitely some interesting reactions to the Fitbit smartwatch. We also got some Ionic news this week with the Adidas edition scheduled to land in March, just in case you were still holding out for that. Team Wareable was out in Barcelona this week to see what the future of wearable tech holds. Except much like last year, it was a bit of a quiet show with the big names like LG, Huawei and Samsung not having much to talk about right now. We're sure they'll have something in store for us later in the year. In fact, it sounds like a Huawei Watch 3 will be on the way, and there's rumours that LG might have another smartwatch for us to. Let's not forget about the Gear S4 either. But back to Barcelona, and while the big names focused on all things smartphone, there were still some really interesting stuff that came out of the show. From VR, hearables and some unique looking smartwatches like the Haier Asu one pictured above. Have a read of 0ur best wearables spied at MWC 2018 to find out the highlights. A blast from the wearable past. Google Glass isn't dead - it still lives on in the enterprise world - but its consumer version is most certainly buried. However this week we learned that the smartglasses could be resurrected in the future. Rick Osterloh, head of Google's hardware division, teased the possibility that the company explores the idea of proper AR glasses, but believes the technology to make it happen needs to improve greatly before they can have mass market appeal. With Apple, Facebook and even Amazon looking to enter the AR space, it wouldn't be all that surprising if Google did decide to give things another go. Just not for a few years yet. Speaking of which, the big news to round off the week was that Snap has a couple more pairs of Spectacles in the pipeline, one of which we should see later this year, if the latest report is to be believed. Is it just me or does this look an awful lot like a Pebble?